Investment Pathways: Why, What and Where Next? Last week saw the FCA launch an updated consultation paper on its Retirements Outcomes Review. We’ve supported this from the beginning, and responded to the original consultation back in August 2018. Like many others in the industry, we’ve been looking forward to this update – and it didn’t disappoint. We’re pleased the FCA is continuing with its key recommendations, with a few surprises and a handful of questions too. We also feel there’s a bigger opportunity for the industry to make advice more readily accessible. Read on for a brief summary of the paper and our take on the opportunities for the industry. We also look at how we can best meet the needs of people retiring post-pensions freedoms. The FCA is concerned that following the introduction of pensions freedoms, many consumers could lose out on retirement income This could be through poor decisions, like having pension pots inappropriately invested in cash, or due to choosing investment options or income withdrawals without understanding the long-term implications. 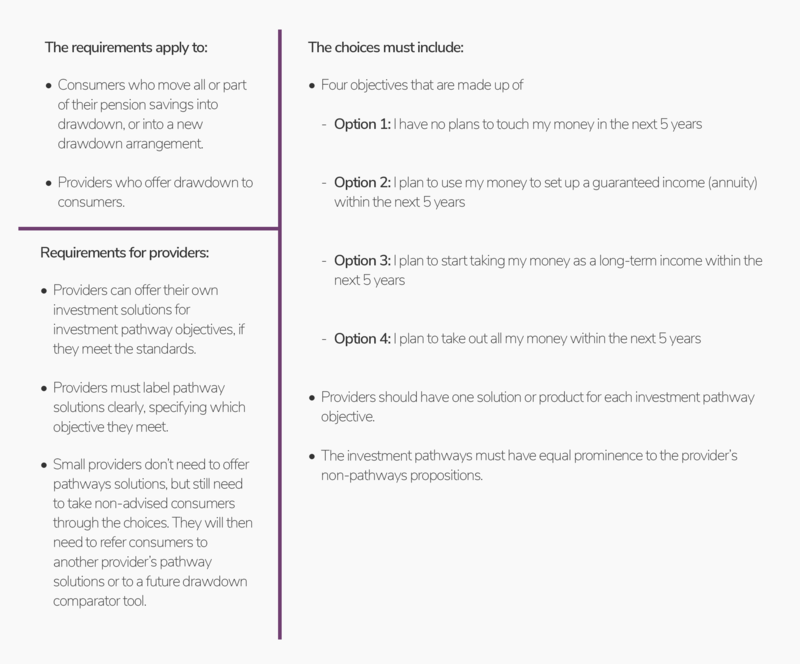 The FCA proposes that a set of four investment pathways will help non-advised consumers make better decisions about their money. After an initial consultation and the resulting feedback, the regulator has released an updated paper. 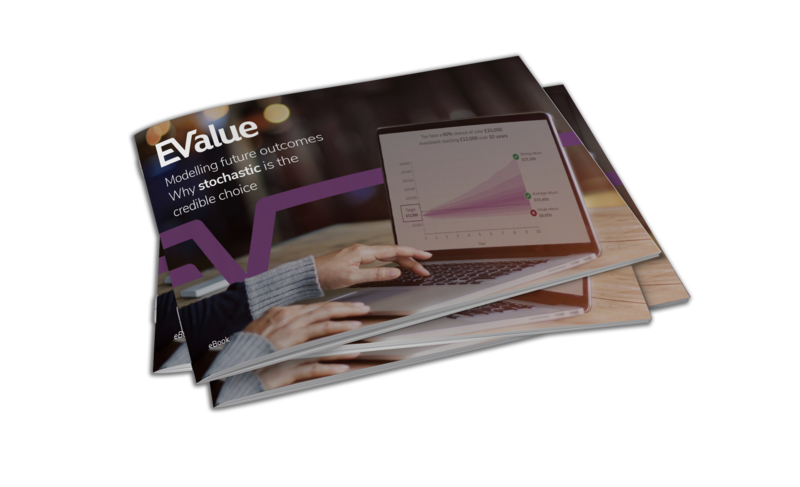 It clarifies what it expects from pension providers, how the investment pathways should look, and why it's so important. If you haven’t yet read the entire paper yet, you can find a short recap of the executive summary below. After considering the paper in detail, we’ve identified several areas where we think the industry can make a difference. One key theme running throughout is the danger of cash. The paper estimates around 33% of non-advised consumers are in cash, as well as 18% of non-advised SIPP consumers. People are spending or moving their tax-free cash then abandoning the rest of their pension pot. And while in the short-term, cash is a viable option; in the long-term, it can be detrimental. Their money is dwindling away – and it’s not working for them. Pension providers should help their customers see the pros and cons of cash. People may not realise how much they’re missing out on until they see it in black and white. An illustration of inflation and cash returns, personalised to the individual’s information, will help them choose the right path. They can clearly see what will happen to their pension if left in cash and make a better informed decision. Yet the only way to illustrate realistic risk and reward is by showing the range of possible future returns. And using a stochastic forecast – is vital for this – especially when it comes to the effect of inflation on your customers’ investments. You can use this to highlight why cash is good in certain situations, but bad in others. And you can do it without confusing a customer with reams of complex information. Plus, when projections are personalised and easy to understand, you encourage people to engage with their choices. How informed is the general public about drawdown? About annuities? About inflation? About investment options? Well, it’s safe to say that it isn’t common knowledge. And when people aren’t informed, they’ll do what’s easiest and what they understand. Which may explain why so often this results in sticking with cash. So, we need simple and clear ways to help people understand their options. The FCA’s user testing showed when people were exposed to different scenarios and could play around with various options, their understanding increased. In the testing, once people had completed their fifth scenario, they were getting the right answers more often. In a nutshell: the more scenarios people completed, the greater their understanding. We know that play and repetition aids learning. Now, we need to include this in our processes – and help educate people. By taking customers through different and multiple scenarios, providers can help them make the right decision for their own situation. And as the FCA’s research showed, this is more effective than using dry or complicated wording and descriptions. The FCA’s stance is clear: pension providers need to take more steps to ensure their customers get the right outcome. And nothing is more important than keeping it simple. To the general public, our industry is full of complex terms and obtuse language. So, providers must use clear descriptions and highlight which investment pathway they’re referring to. The user testing also found that people didn’t necessarily understand pot splitting. So while it might make sense to suggest a combination of solutions, it could make the process too complex for non-advised consumers. Instead, providers should give people simple propositions that deal with one objective at a time. The FCA wants to ensure all investment pathways are given equal prominence to a provider’s original solutions too. This could mean that providers will need to change their propositions to keep it simple for customers. The FCA further consultation period ends on 5 April 2019. And while there were many useful updates within the paper, we believe there’s still room for further clarification. Will the standard of communications need to improve? There’s lots of talk about the communication of the proposed investment pathways. But it appears that pension providers will only need to do the bare minimum. In particular, we fear that using a deterministic projection will only give an investor basic information about their situation. And this doesn’t properly differentiate between products and misses out vital information. For example, providers might not have to explain why a particular investment strategy is good for Pathway 1 but not Pathway 2. We believe pension providers should give their customers much better illustrations of their choices, illustrating what their financial future looks like under each option. This could be a useful pack or an interactive experience that gives people insight into their situation. But within the current rules, we worry these documents will be about as exciting as a paper statement – and less informative. 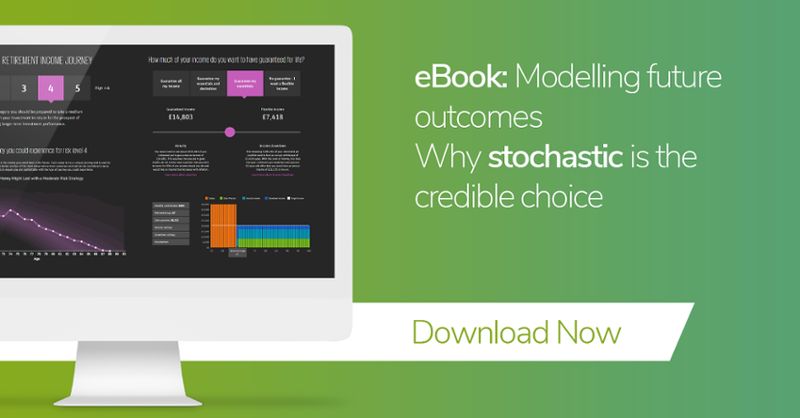 You can read more about the benefits of stochastic models in this eBook. Where’s the line between advice and guidance? Pension providers have a lot of personal information that can show people the consequences of taking various pathways. And if this was illustrated, people are likely to make much better decisions. This approach could see the investment pathways becoming a success and truly helping people. But as making judgements based on personal information is advice, will the pathways create a grey area between advice and guidance? Because surely this is needed to make investment pathways work. This is an area we’re keen to clarify further. How can we get the risk balance right? There’s a Goldilocks effect in drawdown when it comes to risk. Before taking a pension, there’s worry over taking too much. While in drawdown, there’s worry over not enough risk. So, where’s the ‘just right’ option of ‘just enough’ risk? And how can providers find this? Research also suggests people underestimate their life expectancy when they’re young, and may overestimate it when they’re older. 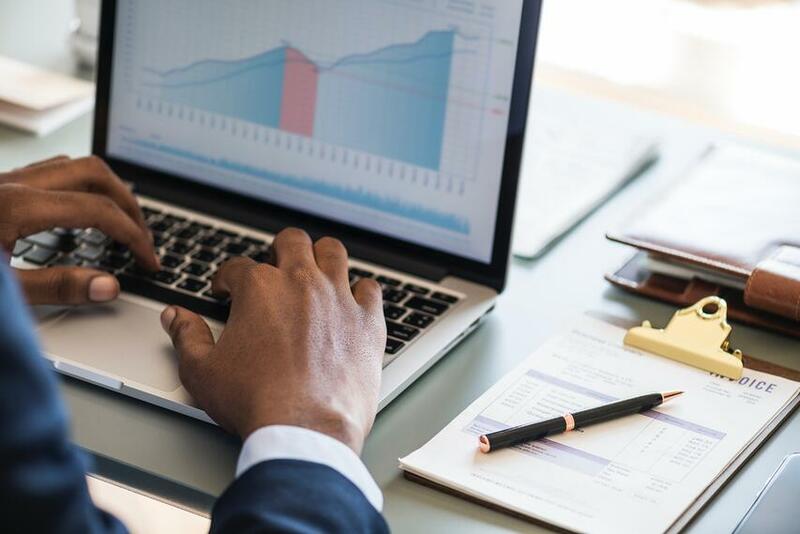 So, there’s an acute need to help retirees understand both investment risk and its relationship with their income needs and life expectancy. 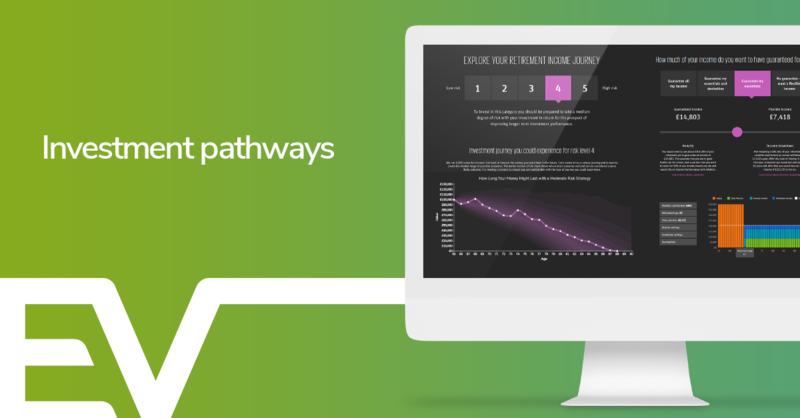 The investment pathways approach may sound daunting. But we believe there are four ways the industry can start to make changes. Adopt robust, proveable ways to ensure your pathways are suitable for customers. This may come down to working with a partner or using a bespoke tool. Communicate clearly and simply to customers, without bombarding them with information. Ensure you’re giving them information to make choices in a way that benefits them. Does a 20-page report sound more appealing than a two-minute video? 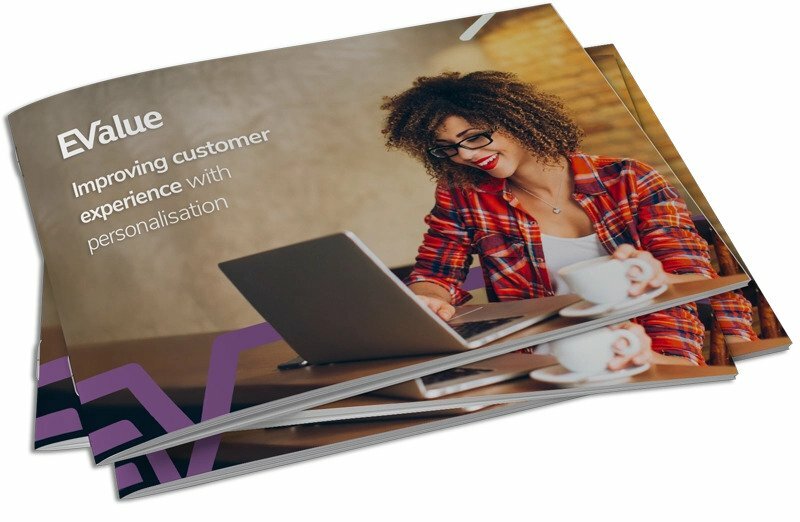 Use technology to ensure these communications are personalised to every individual customer, in a cost-effective way. Find a way to give further guidance if a customer doesn’t choose an initial objective – whether that’s giving more information on a dedicated website or going through the pathways in more detail. Keep an eye out for more information from us on investment pathways, as well as engaging approaches to support wider guidance at and in retirement. We’re working on different ways to help support you and your customers through this change. And we’re happy to talk about our proposed ideas. Let us know your thoughts in the box below.